My Garage Door Won't Go Down! 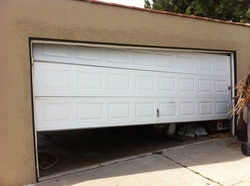 There are two basic reasons why a garage door won't go down. One is very easy to remedy, the other is best handled by a professional. Take a look at the to examples below for more information and click on the link's to follow the troubleshooting process. Do you notice one site higher than the other? This is a textbook tables off situation, where one side of the door cable has come off the lift from and the other side still has some torsion spring tension. In this case the door will not move without professional assistance. Click here to see you before and after work. this is the photo optic sensor of your garage door opener. It is located about 6 inches off the floor on or behind the track of your garage door opening. 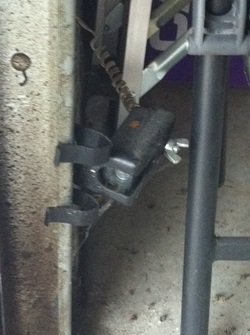 When this is out of alignment your garage door opener may only move your door a small amount or none at all. Follow this link to learn how to troubleshoot this problem yourself without ever needing a service visit. If neither these descriptions matches your service issue, read below for more information and click on the links below to find out if your situation applies. Garage door operator Motor blown. Stripped Liftmaster/Chamberlain/Sears craftsman gear and sprocket assembly. Stripped Genie garage door opener traveler.